Bring the scavenger hunt to the baby shower celebration you're planning. The wonderfully fun handbag hunt game is the perfect choice to help guests have fun! Family and friends will love scavenging through their purses, totes or handbags to see how many points they can gather! Handbag hunt is a great alternative to traditional baby shower games, perfect option to any party you're hosting. Designed for boys baby shower, girls baby shower, gender reveal parties or any celebration for baby. At Paper Clever Party our baby shower games are printed on thick, card-stock paper, compare to others which are flimsy sheets of paper. Finished game card measures 4 x 6 inches. BONUS; baby shower what's in your purse game set arrives READY TO HANDOUT AND PLAY, no messing with mass-produced DIY or printable games. Be the hostess who is prepared, have pens or pencils on hand at the baby shower for guests to mark their game cards and tally points. Playing baby shower handbag hunt is for everyone! Guests will enjoy hunting and searching to mark the items off the game board list. Person at the end with the most points wins the baby shower game prize. YAY, as the host you determine the time limit on the handbag hunt game. This whats in your purse game makes a conversation starter or play with other games with prizes for baby shower. Stylish game card doubles as decorations or favors coordinating a variety of baby shower, sprinkles, gender reveal party themes. Add to cart and keep your group amused with baby shower games that are fun, enjoyable and unique! However you plan to celebrate it, this handbag game is big fun for baby shower celebrations! WHAT'S IN YOUR PURSE - baby shower games to help your guests have fun and celebrate - this handbag hunt will add a dose of enjoyment to your jungle baby shower for baby boy or baby girl. SET OF BABY SHOWER GAME CARDS - hand out Whats in your purse theme game cards for a special activity at mommy's shower, gender reveal, sprinkle or any get together celebrating the new little peanut. FUN HANDBAG HUNT BABY SHOWER ACTIVITY - have your guests hunting through their handbag to find the items on the game board list - while laughing and enjoying the game you've planned. Lighthearted, amusing and memorable way to find out which family or friend has the most points to win the big prize. 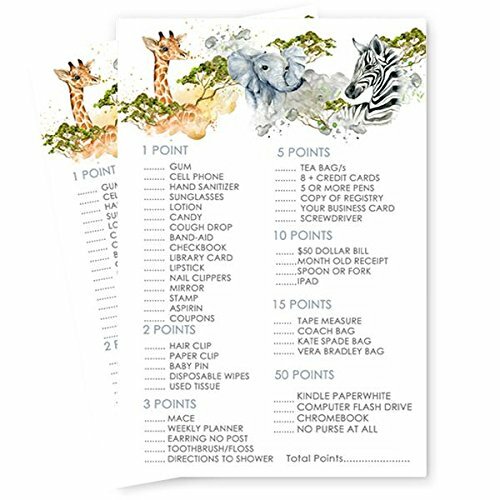 JUNGLE ANIMAL BABY SHOWER PARTY SUPPLIES - cards measure 4 x 6 inches in size - durable, easy to write on baby shower games -family and friends will have big fun competing for baby shower prizes. Jungle design for neutral baby shower, printed cards loaded with cute elephant, giraffe and zebra for great idea for safari, adventure, or any animal themed baby shower. BABY SHOWER GAMES by Paper Clever Party are printed, packed and designed in the USA with love, using responsibly sourced materials. If you have any questions about this product by Paper Clever Party, contact us by completing and submitting the form below. If you are looking for a specif part number, please include it with your message.